SAMSON is a software platform for computational nanoscience. Rapidly build models of nanotubes, proteins, and complex nanosystems. 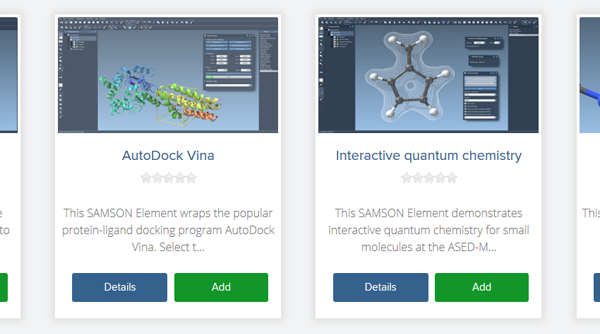 Run interactive simulations to simulate chemical reactions, bend graphene sheets, (un)fold proteins. SAMSON’s generic architecture makes it suitable for material science, life science, physics, electronics, chemistry, and even education. SAMSON has an open architecture which allows anyone to extend it – and adapt it to their needs – by adding SAMSON Elements (modules) to SAMSON. SAMSON Elements come in many flavors: apps, editors, models, parsers, etc., and are adapted to different application domains. 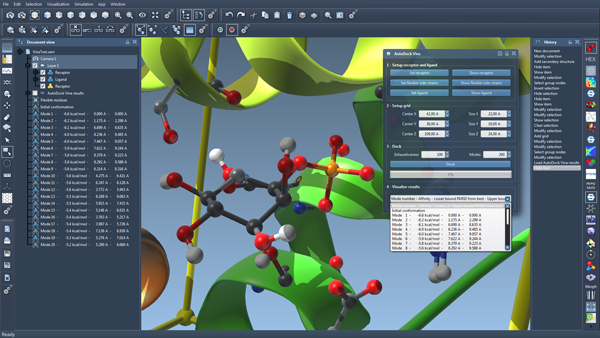 SAMSON Elements help users build new models, perform calculations, run (interactive) simulations, visualize and interpret results, and more. SAMSON Elements are added from SAMSON Connect. New SAMSON Elements may be created using SAMSON’s extensive Software Development Kit (SDK). Helper tools make it possible to generate new SAMSON Elements in a few clicks. Test your ideas by developing new interaction models. Interpret your simulations by creating novel visual representations. Design new apps to perform never-before-seen tasks. Wrap existing tools (or write connectors to them) to benefit from interactions with SAMSON and other SAMSON Elements. Then share it all on SAMSON Connect. SAMSON requires a 64-bit operating system and a graphics card supporting OpenGL 3.2. Please note that integrated graphics cards (e.g. Intel HD graphics cards) are not appropriate. The School program allocates some time for setting up SAMSON for all participants, but if you want to make sure your computer is compatible, you may already download SAMSON from SAMSON Connect. The School program allocates some time for setting up the SAMSON SDK and development environments for all participants, but you may already download the SAMSON SDK from SAMSON Connect.